I'm a big fan of broccoli-cheese soup. I rarely meet one I don't like. My restaurant favorites so far are from Outback Steakhouse, Panera Bread & Quizzno's. I modified this recipe from one I found on the Food Network. I didn't like a few of the ingredients in the recipe I'd found, so I substituted them out, and added a few new ones for good measure. I really love it and I think you will to. *Make sure to use medium heat while completing this recipe as you don't want your soup to scorch. In a large saucepan melt together your butter, flour, and minced onions. I like to cut my onions as small as possible, because I don't want to eat a chunk of onion. You can dice your pieces instead if you prefer a larger piece. Cook those ingredients together for about a minute, and then slowly add in the half and half about 1/4 cup at a time, making sure to whisk constantly. When all of the half and half is incorporated add the frozen broccoli and Velveeta. When the cheese is completely melted, add chicken broth one cup at a time until soup is well mixed and has a consistent texture. Next you will add your shredded carrots and simmer soup for about 10 minutes. After ten minutes, add the shredded cheese then simmer for another 10 minutes, stirring ever so often to maintain consistency. Serve when all cheese if fully melted. If you are concerned about salt, you can use a low sodium chicken broth instead. If you have leftovers, make sure to place them in an airtight container. When reheating leftovers, you may want to add just a little milk before reheating, as the soup may become thick once refrigerated. 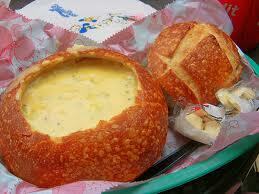 This soup is excellent served in a bread bowl or with rolls. For a different twist, try this soup poured over a bed of rice or mixed with pasta. thanks for linking in. Today's new edition of Food on Friday is about cocktails/mocktails. Please do link up anything you have to share on that topic.